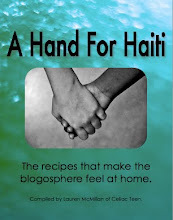 Kate The Bake: Buy "A Hand for Haiti" E-recipe book NOW! Lauren who blogs at Celiacteen has pulled together a collection of recipes donated by bloggers from all around the world, which is being sold to raise funds for the Red Cross in Haiti. This is a collection of over 85 recipes and more than half of them are gluten free. Every one needs a few gluten free recipes in their collection so what a great way to gain a few new recipes as well as a chance to discover lots of food bloggers from all around the globe. This is a great cause, and really we are lucky to be rewarded with so many great recipes for such a small donation. The book sells for a minimum of $10 Canadian dollars, but when you consider that $15 Canadian dollars is still less than £10, this book is worth at least $15 Canadian dollars of every-one's money. PLEASE BUY THIS TODAY - if you buy before the end of FRIDAY 12th FEBRUARY, the Canadian government will MATCH each donation that you make. Really! So, spend a tenner, get a cook book and the warm cosy feeling of knowing that $30 Canadian dollars will be donated to the Red Cross for Haiti. There isn't much more to say, just buy it!